Take place the first Friday of every month, 5:00 - 8:00 PM except when the first Friday coincides with a major holiday, then the reception dates will be posted on the front page. All events are free and open to the public! We are located at 486 Harrison Avenue between Thayer Street and Randolph Street in the SOWA District (next door to Cinquecento). Walk up stairs near elevator and out to Washington St. Silver Line T-Stop. Take bus 2 stops to E. Berkeley St. Stop. Walk 1 block to 1200 Wash. St. and take pedestrian walkway left to Harrison Ave (note Jack McLaughlin Memorial). 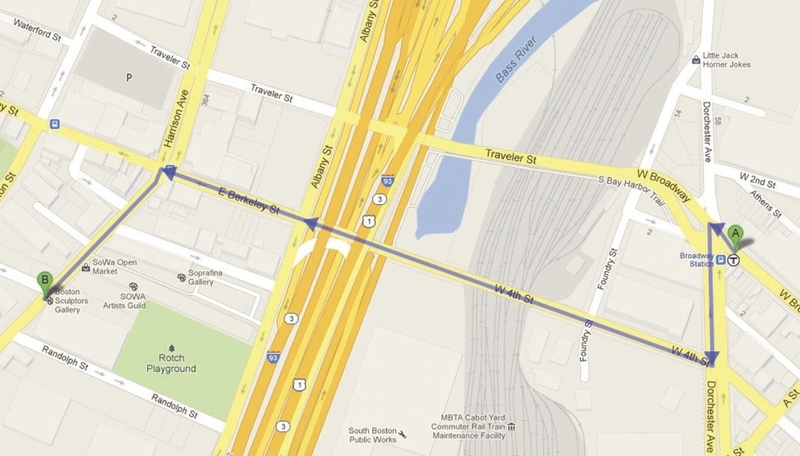 We are across the street at 486 Harrison Ave.
Take the Mass Pike Eastbound to the South Station exit (24A). Turn left at the light at the end of the ramp, and left again on Harrison Ave. Cross over the Pike and we are three blocks down on the left. Take exit 18, go to the 4th stop light (.8 miles). turn left on E. Berkeley St. (Back Bay, south end), Turn left at first light on Harrison Ave. Go 1 block. to Parkling lot at 486. Take the I-90 W exit 20- toward Worcester/Albany St. Take the Albany street exit on the left toward south Boston. Turn slight right onto Albany St. Turn right onto E Berkeley St. Turn left onto Harrison Ave. Whether traveling East or West on Harrison Ave (Rte 9), get on to Mass. Ave. at Symphony Hall going away from Cambridge (Southeast). Take the 5th cross street, Washington Street, to left– which is the street after Shawmut Ave. After approx. one half mile, take right onto Waltham Street. Take first left onto Harrison Ave. On right one block down, look for B.S.Gallery just after sign for Ars Libri books. Gallery is first floor entrance at #486. There is a parking lot to left of the building and street parking. Two hours of free, validated parking is available behind the gallery. We are wheelchair accessible through the ground floor entrance to the left of the front door and via the parking lot. Ring bell to notify the gallery attendant and use the elevator.